Tahiti & her islands are among the most expensive travel destinations in the world. But here’s the good news: visiting Tahiti can be done on a budget, without giving up on comfort or skipping fun things to do. Here are 7 tips & tricks to travel to Tahiti and her islands on a budget. We always think that French Polynesia is all about luxury hotels and spectacular over water villa’s, but guess what: there are plenty of (very) good family pensions to choose from and we’re pretty sure you’ll have a great time there. Tahitians are very hospitable, no doubt you’ll get pampered there’s an extra bonus: it’s a great way to connect with the locals and you’ll get some priceless inside tips where to go and what activities to do, at a fair price. On www.tahiti-pensions.com you’ll find all the info you’ll need. If you really want to travel French Polynesia on a budget, you may want to consider camping. Don’t think: classic camping site. Think: the garden of a guest house. Very basis, but if you feel the need for some extra luxury, the guest house is just a few steps away. Another (no) budget travel trip is couch surfing. Check out www.couchsurfing.org and stay with locals. It’s the best way to make new friends and travel Tahiti and her islands on a true budget. When I first checked out the couch surfing possibilities in French Polynesia, I was really surprised to see how much guest offers there were. Staying in one of the most beautiful parts of the world doesn’t come any cheaper! If an over water stay on Bora Bora will kill your credit card, consider the island of Tahiti for your over water fantasy. You’ll get the same luxury and the fabulous VIP-feeling, but at a lower rate. And although Moorea is also quite expensive there’s the Moorea Club Bali Hai Hotel to check out (around 365 dollar for a two bedroom over water villa, for 5 persons). There are lots of islands in French Polynesia to explore and they all have their own personality, characteristics…and prices. BoraBora will be the most expensive of all but there are a few, lesser known islands to explore. Raiatea, Taha’a (Society Islands), Nuku Hiva, Ua Pou (Marquesas) or Rurutu (Australs) are just a few islands that give great value for lesser money. We stayed a couple of nights on the beautiful and affordable islands Raiatea and Taha’a and had a wonderful time. You might get lucky and find a cheap good package, offered by a travel agency. These are mostly all included (with flights) and offer multi-islands visits. Downside may be that these packages are offered last-minute and you can’t choose the travel dates yourself. Tip: if they’re not offering special rates, just ask. We often did it and most of the time we got a discount (or an upgrade). When you go island hopping in French Polynesia, it’s a good idea to check out the flight combo’s Air Tahiti (the domestic airline) is offering. There are 6 islands-hopping air passes which will save you up to 30% on normal flights. Tip: a good way to save money when you’re hopping from Tahiti to Moorea, is by taking the Aremiti ferry instead of booking a flight. The flight takes 10 minutes, the ferry 30 minutes. Don ‘t get your hopes up: food can be very expensive in French Polynesia. Still: Tahitian cuisine is very tasteful and it would be a shame to skip all the yummies. …and seafood in a coconut. Maybe you’ve stumbled upon a relatively cheap stay in a resort? Great! Just make sure breakfast is included: the bill of that nice buffet breakfast will make you lose your appetite. Having breakfast included leaves more budget for a nice sunset dinner. Go to the local market and buy all the fresh fruit you can eat. Enjoy them while siting on the beach or relaxing in your room (definitely cheaper than ordering room service). If you’re staying in a family pension, then most likely they offer half board. Go for it and make that reservation: pensions usually serve local dishes at very reasonable prices. May to October is high season (read: high prices). The lowest prices you’ll find from December to March (when the weather is unstable and showers are frequent). November and April are shoulder season months, with lower rates and still a good chance on sunny weather We went end November & the beginning of December and had only a few showers in the evening, so that was a good gamble. These are just a few tips on how to save money while traveling Tahiti and her islands. I’m sure there this list in not complete so if you have any interesting tips & tricks to add, you’re welcome to share them with us! This is definitely paradise on earth! Your tips are worth remembering! Great tips and photos. We would love to go there one day. After meeting a guy on our travels from Tahiti in Cambodia, it was stuck in our minds for days. It looks so beautiful and romantic. We are budget travellers but want to see wonderful and romantic places sometimes, so these tips are great for us. Thanks Nina. Wow! This is really making us desperate to check out Tahiti. Loving the photos. I’m surprised to hear CouchSurfing has so many options in Tahiti, for some reason i don’t see it that way. Great budget tips. Thank you so much for this! I am bookmarking this, as Tahiti is a dream destination of mine. Hi Paul! True, and we always try to travel shoulder- of low season. For budget reasons and because places aren’t packed with other tourists. Tx for the visit! So true Sam! 🙂 I do worry about the costs sometimes, especially when I’m back home and check my credit card account. But: I used to travel for months and did that on a backpackers budget. Now that I’m working I can only go traveling for only a week of two weeks so I want to get the most out of it. Great photos and some very good tips here. Love the idea of staying with a family too. Much more interesting .Although I wouldn’t turn my nose up at a few nights in an over water villa for a few nights too. YOur tips will should prove very useful when I make it here, which I hopefully one day. Hi Kathryn, the water villa was fantastic, it was so special to ‘live the fantasy’. 🙂 But staying with a family is indeed so interesting, and very affordable. I think that maybe the best way to experience Tahiti is to mix the two. I’m sure one day you’ll make it to Tahiti! Do you have any tips for how to contact potential families? Are you referring to couchsurfing sites, or is there another way to link up with locals? Thank you! Great post Nina that I am sure a lot of folks will find beneficial especially if they are considering heading to Tahiti anytime soon. Personally I consider Tahiti and Bora Bora to be once in a lifetime destinations so I would probably want to go all out and explore these without worrying about the cost. I also appreciate though that we don’t want to get ourselves into financial distress purely for a single vacation, so your tips here would likely come in very handy whenever we decide to take the plunge and head there. Tx Chris! 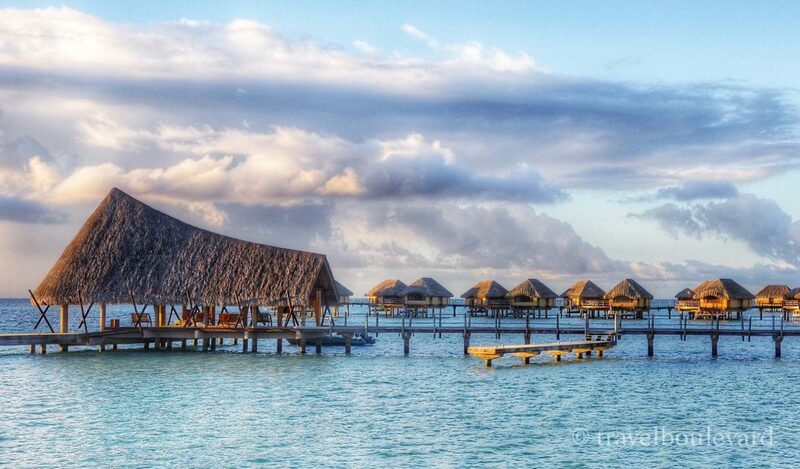 Couldn’t agree with you more: Tahiti and Bora Bora are indeed a once in a lifetime destinations. Since it’s so far away from everywhere getting there will always be expensive, but that doesn’t mean this holiday will make you go bankrupt. Like you say: it’s good to know you don’t have to put yourself into financial distress for a single vacation. It’s all about making the right choices. I had no idea Tahiti was one of the most expensive but this is a great list of tips to keep look for othere options. I guess it does strike me as a luxury honeymoon destination though. I’d still looove to visit, it looks simply breathtaking. Your tips are so true, I wrote something for ALTB previously on a similar vein as many people don’t realise that places like this are attainable!! Although the flight price from the UK would be the most crippling bit! Shoulder season is key – we often travel then, great deals, but also you see the country at its best when it isn’t heaving with tourists! I’d also agree with you about seeing the less popular islands – if you go to Bora Bora then you may as well just go to anywhere on the mainland – somewhere like that is about the reality of life and the locals, not the expense and glamour of a hotel!! Great article! Hi Anna, so true: we often travel shoulder season not only because it’s so much cheaper and also because – like you say – places got less crowded with tourists. And true: the lesser known island are so interesting to visit, I found these even more impressive than the famous ones. The photos are stunning and I love the tips you’ve included, they really give lots of great ideas for enjoying Tahiti and her islands on a budget. I especially like learning about the family pensions, which seems like a very good option. Hi Jackie, family pensions are indeed a good option to save money and it’s a fantastic way to meet the locals. People are so generous and welcoming, they make you feel like you’re part of the family. Cool post! Tahiti ‘sounds’ expensive so I’m glad you also visit the island when on a budget! Great, I loved to visit Tahiti on a budget, the island looks so amazing.